If small business didn’t have enough to worry about with their marketing and advertising efforts, then along comes data that will definitely have an impact on their local business marketing. Integrated digital marketing encompasses all aspects of marketing efforts online, including mobile, website, search, content marketing and social media, not to mention email marketing as well as paid media. But what impact will all of these marketing channels have on small business trying to compete in their local markets as the growth of paid digital media advertising grows? According to a recent report, paid media is expected to surpass TV advertising next year. This might make some small business owners that don’t worry about television advertising shrug their shoulders, but we suggest you continue reading. Where brands are spending their marketing dollars and the trend moving away from TV and toward online marketing channels, will impact local digital marketing, and in potentially significant ways and here’s why. As many larger national brands, as well as large local brands move TV advertising dollars toward paid media channels online, the challenges facing local small businesses will increase. Not only will small business face the current level of competition with the normal suspects, the new paid media dollars from national and local TV advertisers will further encroach on their digital visibility. This additional competition for online eyeballs, impressions and clicks will affect the local business marketing efforts significantly. More paid media by more businesses advertising online will reduce your ability to be seen and heard. If local brands continue to do what they are doing today with their online marketing strategy, paid media spend and non-paid online marketing like social media and email, their net results will continue to decline substantially. 52 percent of companies have a Sponsored (Paid Media) Social Media budget for their brand. Companies find Sponsored Social Ads to be in the top 3 effective marketing investments. Consumers say that paid social media messages are equally or more effective than TV commercials. 54% of Marketers feel better about Sponsored Social Ads over years past. Most Sponsored Ad Social Media Marketers compensate monetarily for creative development. Over one in three adult online users age 18-70 have seen a Sponsored Social message in the past year. Sponsored Social is a highly effective marketing tool that benefits brands, Creators, and consumers. Paid media spending online is growing at more than six times the rate of TV. Paid media spending on digital is expected to surpass TV by next year. Digital media ad spending, is currently surpassing all previous expectations. Paid media digital spend will jump 15.4% this year to over $68 billion, which will be 35.8% of all media ad spending. Paid advertising online is expected to reach almost 45% of the total media spend by 2020. The amount being spent on mobile advertising is rising at a faster rate than previously expected. For those local business owners and small business marketers that don’t yet know, it is important that you have a good understanding of what paid media is. Sponsored posts, digital advertising, pay-per-click search ads and social media ads are part of the paid media ecosystem online. It is about paying to be able to target your intended customer at various times during their purchase journey, and doing it where they are spend their time. No More Organic Social Media Marketing? Well, it isn’t completely true that organic social media marketing is no more, however, small business needs to understand that social media marketing and specifically Facebook has really changed over the last few years. Facebook is no longer really a social network that businesses can use to connect and engage with their target audience as it once was. Facebook is now an ad network that requires businesses to pay to target network consumers with sponsored content and straight advertising posts that appear in a users normal newsfeed timeline, right along with the content from their friends and family. This is social networking for business on Facebook today. Without paying to boost your Facebook page posts, Facebook automatically reduces the number of times your page posts are shown to people that have liked your page. Paying to boost your page posts on Facebook, increases the frequency that your post is placed in users newsfeeds and therefore the exposure that post will receive goes up. More people see the content you are posting and that CAN increase views, likes, clicks and shares. Similarly, Facebook advertising allows a page to create and target ads within the social network. However, different from boosting a content post, Facebook ads has a much deeper targeting function that allows you to get your ad in front of a specific type of prospect geographically, based on interests and several other targeting dimensions. This kind of paid media marketing is best used to drive traffic of your target audience for a specific offer, product or page on your website. With the clear changes that are happening between traditional advertising channels and digital marketing channel budgeting, small business needs to take a serious look at where and how they are conducting their marketing today. The digital marketing climate is going to become even more competitive within local markets as ad spending moves more digital. Local companies need to recognize that marketing within this environment is going to require them to step up their marketing game in ways they never considered. Local business marketing now must incorporate integrated multi-channel online marketing that includes acquisition and retention of customers through all digital marketing channels. This includes advanced mobile website design, search optimization, social media, email and content marketing, right along with the addition of paid advertising across many of those same channels. The digital consumer is no longer a myth or something new, but a trend that is going to only increase. Small brands must expand their digital marketing footprint and resources if they are going maintain their market position locally. As times change, small business marketers must as well. 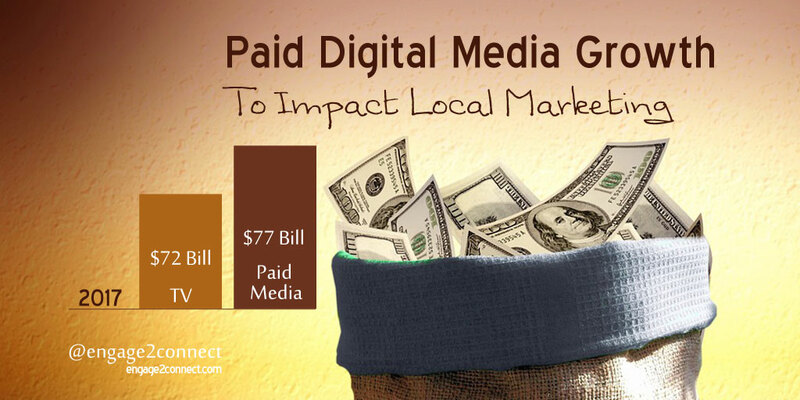 Paid digital media marketing is no longer a nice to have, it is a requirement for even the smallest, local business.